Healing of the Paralytic. 2nd Sunday of Great Lent. Questions. A few pertinent questions and answers from a longer set about the healing of the paralytic at the sheep's pool. Physical afflictions are often an indicator or reminder of the more serious affliction that besets all men – sins, and the passions which are the major cause of them. Our passions are like blindness or paralysis, because they impair our ability to live a righteous life, and cause us to miss the knowledge of God, as a blind man cannot see and a paralyzed man cannot go where he wants. This connection between the passions and sin and physical afflictions is well known in the mind of the church. This is not to say that sin always CAUSES physical afflictions. This is possible, however, in every case, afflictions are a reminder of our primary affliction and need for God. The Healing of the Paralytic – Mark 2:1-12 What is the вЂњpressвЂќ? How do we get past it? In the name of the Father, and of the Son, and of the Holy Spirit. Amen . Today, brothers and sisters, on the 2nd Sunday of Great Lent — the day on which we celebrate and commemorate St. Gregory Palamas — we have before us a man who is paralyzed, and who has friends that care for him and bring him to the Lord to be healed. Now, as in all scripture, we should be careful. Read the scriptures slowly and carefully. See what the Lord says to you, see where you fit into this scripture, see where you have vices — or perhaps where by the grace of God, God has helped you in some thing and you have some virtue — not of your own worth, but because God has helped you. This is how we should read the scriptures. This is not just history, and something that happened a long time ago; this story is given for our edification. The Lord healed many thousands of people, and we don’t have very many records of His healings. So there must be something important about the way this man was healed for us to take note of. He comes to Capernaum, and He is very popular in these days; this is still in the – shall we say, the honeymoon period; all the common people Him. The scribes and the Pharisees didn’t like Him, but they couldn’t move against Him, and even some of them were somewhat taken by Him because of all the buzz that was around Him. Everyone was saying, “Can you believe what’s happening? Everyone is being healed, and this man is speaking with such authority…” At the beginning of His ministry, there were many who loved Him and wanted to throng about Him (who would later leave Him, and even be accessories to His being slandered and murdered), and this is the case today. There are so many about Him that people can’t even fit in the house where He is preaching. They are all about, outside the door, and He preached to them. There is a man who is paralyzed, and he has asked his friends to help him. He has four that will take him on his bed, and want to bring him to Christ. Because of the press (the crowd of people), he couldn’t get to Jesus. What is this press, brothers and sisters? This "press" is often mentioned in other healings; this press is the obstacles that we encounter in our Christian life. We encounter great obstacles. Now in the case of this man who was paralyzed, he wouldn’t have the strength to press through a group of people on his own, and even with help it would be immensely difficult; how can you carry a stretcher through a huge crowd of people? It is not possible. So what did they do? They overcame the press by climbing onto the roof. A roof is high above all things. The scripture uses this analogy just as it uses mountains sometimes, to say that this is how we should be in our Christian life. We should look up — we should be thinking of spiritual things, not of carnal things, not of just daily things — and we should elevate our mind — to contemplate pure things, and things that God wishes us to know. These people got up on the roof. So of course it was a practical act to get up on the roof, so that they could break the roof tiles and let him down, and it was rather ingenious actually. But it is also an indication of how we should be, brothers and sisters. You know, we encounter the press, and we stop in our tracks. Let’s face it: this society is a very difficult one for a Christian to live in, because there is such coldness, and it infects all of us. There is such materialism, there is such hardheartedness, there is such wishy-washy-ness as far as what to believe. And even among the Orthodox, there is this sort-of mixing of the world with holiness — and, of course, what becomes of hot and cold? It becomes lukewarm. And the Lord hates lukewarm. The whole world is lukewarm. And we live in this difficulty. This is the press. It’s quite hard for us to live in this world. In fact, I was reading something from Fr. Anatoly the younger, who was a martyr, one of the last Optina elders. I can’t quote it well, but basically the inference, the gist is of what he was writing is that Christians in the last age won’t do great miracles, and their faith won’t even be that great, and their purity won’t be that great. But, because they have endured in a time which is the worst of all times, God will give them a crown for even being Christian during this time. Indeed, because it is a difficult time. It is a time of unbelief, it is a time of lukewarm-ness, and we are surrounded by it, and we are infected by it. So it is difficult for us to get past the press. And why should we get past the press? Because we’re paralyzed too. We have spiritual paralysis. We have spiritual blindness. If any man can look inside himself with any amount of honesty at all, he sees that he is really broken inside, incomplete. There are terrible sadnesses that happen in our life. There are terrible things that we just can’t cope with completely. And I say, if any person thinks that life is easy, and that things are really okay, than I say that you should really be afraid, because God is far from you. According to the fathers, if we’re not tempted, then we’re not being saved. Because we ARE incomplete, and we are weak creatures. Oh yes, we have the image of God within us, and God has promised that He will be with us until the end, that He will complete the good work which has begun in us. But in the meanwhile, as we are approaching that goal, there is so much about us that is so pitiable. And we must get past the press if we are truly to get any kind of relief. You know, the press makes a lot of noise, and there is a lot of distraction, and this very well describes the Christian life today. So how do we get past the press? Get up on the roof. Not just get up on the roof, but there must be labor involved in the Christian life, brothers and sisters. You know that one of my pet phrases, or pet ideas, is that the greatest heresy of all time is that the Christian life can be fought without labor, that salvation can be gathered and garnered without labor. This is the great heresy of our age — it has been around now for quite some time — that we can actually be saved without labor. Oh no, it takes great labor on our part to be saved; it takes effort for us to push by the press; it takes effort for us to get on the roof, to elevate our minds to things above, not to things below, not to carnal things, not to just day-to-day living. I think day-to-day living is like a narcotic in our day; it is easy to lose track of holy things, to say “I haven’t read scripture for so long, I forget my prayers, I have the wrong ideas, the wrong motivations,” and to just sort of flow through life. We must fight through these things, get on the roof, have our minds elevated and break through the roof tiles — which is effort. There is great effort involved in breaking through a roof. So then, after these men had broken through the roof, they let the man down. What a spectacle that must have been. This man was not afraid to make his disability known to all. There must have been some people who thought that this was really craziness, and who might have laughed. But he was unafraid, because he wanted to be healed. So when the Lord saw him, because of his efforts, He said “My son, thy sins be forgiven thee.” Well the man came because he was palsied — he couldn’t walk — and the Lord said “Thy sins be forgiven.” He did this for a reason. Of course, what is the source of all of our ills? Our sins! Well, it’s easy to say “Thy sins be forgiven thee,” or something that you can’t see internally, but if you say “Take up thy bed and walk” — well, the man had better get up, or else Jesus would be exposed as a charlatan. Well, that’s rather obvious, but there is a deep meaning here, brothers and sisters. Not an obvious meaning; you have to think a little bit. The Lord raised the man up from his bed – “Take up thy bed and walk, and go unto thy house.” The reason he did this is to show that He, indeed, has power: He can raise the palsied man, He can give the man without eyes sight, he can cause the deaf to hear, he can raise the dead. These are tangible things that we see. The Lord did this because of our weakness. We cannot see our sins being forgiven. It’s not something that you can have evidence of. Sometimes there is evidence of the Lord healing a man in terms of, let’s say if a man is an alcoholic and he is able to no longer have the demon of drunkenness, or some other such thing, but for the most part, when our sins are forgiven, the Lord knows, and we know, but it is not an obvious thing. That’s why the Lord said “Which is easier to say: ‘Thy sins be forgiven thee,’ or ‘Take up thy bed and walk?’” He was trying to show us “I can do both.” Yes, I can say “thy sins be forgiven,” and it is not an obvious thing, but I can also raise up the palsied man. There is another meaning as well. The man’s sins were forgiven AND his body was made whole. Jesus Christ’s resurrection affects the whole man. Every aspect of our personality is affected by the resurrection. This is why a Christian should not feel defeated by anything in his life — because the resurrection applies to everything. Now this is not to have some sort of Pollyanna view of the world and think that because we’re Christians we’ll be rich, famous, athletic and handsome. That might not be the case. But Jesus Christ is interested in anything that goes on in our life. We must bring all the difficulties of our life to him. We as Christians don’t do this very much; we suffer with our worries, our concerns, and I know many of you and I know that your concerns are not frivolous ones, they are not worldly concerns; they are spiritual things. But you must believe in the resurrection, and the one who truly believes applies the resurrection, with all of its implications, to himself, and his life’s circumstances. If Jesus Christ can raise up the palsied man, certainly all the other things that He says must be true — not just that He can raise the dead at the end of the age; He’s going to make you alive now. The kingdom of God is within you. Now, not later. This is the meaning of having the man be healed both of his sins and of his palsy, of his bodily ailments. Now how do we attain this healing, brothers and sisters? By effort. There is no substitute whatsoever for effort. If a Christian does not struggle, does not strive, does not point himself to Jerusalem and not look back, does not try to ascend, as it were, to the roof, and labor, then he will not be changed. Or, perhaps, he’ll bear fruit, but very little. May God grant that we would labor, past all of the difficulties in our lives, past all of the frustrations, all of the distractions, all of our sinfulness, all of our bad habits that are so difficult to change, all that press, all that crowd — that we labor past all that, and set our minds on things above, on holiness, on the purpose of our life, which is intimate knowledge of Jesus Christ. And this intimate knowledge is only possible if we become like Him. We must become like Him to know Him. This is why we must labor, brothers and sisters. Not because there are the Ten Commandments, the Law and all the rest; this is not the reason we must labor. The reason we must labor is that Jesus Christ wants us to know Him, intimately, He wants us to be healed of every single palsied condition, of every blindness, of every black spot in our souls, of every imperfection, so that we can gaze upon Him, not through a glass, darkly, but face to face – and not in shame, but in indescribably joy. This is how He wants us to know Him. And the only way to know Him is to become like Him. This is why we labor for virtue. May God help us to labor, and for the rest of this Lent also to struggle so that when we come to the Pascha, the Lord would touch us in a very special, unique way that we can’t even imagine and understand, and strengthen us. May God help you. How wonderful the matins canon is! Any canon, but especially, it seems, those during Great Lent, interprets the Old Testament in the light of the New. There is a profound mix of history, typology and theology in our services, and the soul is thrilled to hear divine truths expressed in varied ways, with examples from the Old and New testaments. Amalek was a pagan king. He could not be defeated until Moses, foreshadowing our Lord's passion, held up his arms in a cross. In the canon, we have a mystical interpretation of Amalek. He represents sin, just as Babylon or Egypt. We all have an invisible Amalek within us, that is, the passions. Just as Moses held out his arms to defeat the king Amalek, our Lord held out his arms on the cross to defeat our Amalek. Let us take note that if the Israelites had not fought bravely, it would not have mattered how Moses held his hands. In the same way, if we do not live according to the way of the cross, our Lord's accomplishment is null and void for us. Most people have heard or read this passage from Isaiah and understand that it refers to the Holy Mysteries. It is a prophesy of what was to come – after the incarnation of the God-man Jesus Christ, we would be fed with the bread which came down from heaven – the holy Eucharist. Such a man God will heal. “God resists the proud, but gives grace to the humble”, and the greatest grace is given by the Holy Eucharist. We are without excuse, with “no cloak for our sin” if we are too busy, or too lazy, or tired, or too this, or too that to learn how to live the righteous way of life. Evil Jealousy and false pretence. 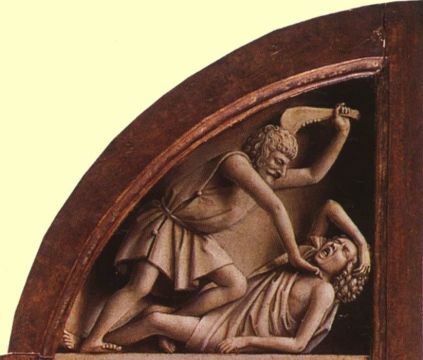 Cain kills Abel. Cain lied to his brother; a jealous man always is also a liar. His lie was not in words, but in intent. We lie to our brothers. Our lie is not in words, but in our thoughts, seemingly private musings, which we forget that God sees. In other words, do not do things because of pretense! Recognize that there are hidden motivations in the dark recesses of your soul; it is not enough to merely feel that you are sincere, you must actively examine yourself to ensure that you are sincere. Jealously is a common hidden motivation for the things we do, say, think and feel, but there are many more hidden motivators, such as: avarice, lust, laziness, and of course, the dark passion that enervates all of these: pride. Examination of conscience is the first and foremost action we must take. We must also firmly resolve to take another, much more difficult action. We must do good to others even when we do not want to. There are two great difficulties in this podvig of a true Christian. At the outset, we must force ourselves to do something we do not want to do. This can be bitter and difficult for the soul, but with practice, we will feel great peace and sweetness. The second great difficulty is more subtle, but very powerful. The Evil one gets our ear, and tells us that is we are doing some good for someone we do not like, that we are being hypocrites. No! We are hypocrites if we call God our Father, and do not behave as His son or daughter! In doing good to others even when we are not so inclined, and even when we harbor bitter feelings, if we do so to force ourselves to follow the commandments, then we are not hypocrites. We are like the son who said to his father that he would not go into the field to labor, but afterward repented and went. We learn to be good by doing good. Let us examine ourselves to be sure that everything we do is really good, and has no false motivations. 8. And Cain said to Abel his brother, Let us go out into the plain; and it came to pass that when they were in the plain Cain rose up against Abel his brother and slew him. 9. And the Lord God said to Cain, Where is Abel thy brother? And he said, I know not, am I my brother's keeper? 10. And the Lord said, what hast thou done? The voice of thy brother's blood cries to me out of the ground. 11. And now thou art cursed from the earth which has opened her mouth to receive thy brother's blood from thy hand. 12. When thou tillest the earth, then it shall not continue to give its strength to thee: thou shalt be groaning and trembling on the earth. 13. And Cain said to the Lord God, My crime is too great for me to be forgiven. 14. If thou castest me out this day from the face of the earth, and I shall be hidden from thy presence, and I shall be groaning and trembling upon the earth, then it will be that any one that finds me shall slay me. 15. And the Lord God said to him, Not so, any one that slays Cain shall suffer seven-fold vengeance; and the Lord God set a mark upon Cain that no one that found him might slay him. solitary prayer is for the very few. Is St. John saying here that we should not pray by ourselves? Certainly not, for this would contradict the entire consensus of the Fathers of the Church regarding prayer, and even the words of Holy Scripture, which enjoin us to "pray without ceasing" (1 Thess 5:17)! St. John himself, in another place, calls prayer "the queen of the virtues," who "cries with a loud voice and says to us: Come unto me, all ye that labor and are heavy laden, and I will give you rest" (Step 28:2). No, St. John wishes to emphasize how difficult it is to pray alone, and how much easier it is to pray together. The context makes this clear, since Step 19 as a whole is about corporate prayer, with others. St. John says that prayer is "the converse and union of man with God" (Step 28:1). So this is not just a matter of repeating the prayers in the prayer book. Prayer is a conversation with God, a lifting up of our mind and heart to Him. And how difficult this is! How hard it is to say our prayers morning and evening, alone in front of our icons – and yet we feel that our prayer at home, feeble as it is, is sufficient. How much stronger our prayer is when two or three of us are gathered together, and Christ in our midst (Matt 18:20). We are not saved as individuals, for it is our selfishness in pursuing our own individual agendas that separates us from God. We are saved by being united to His Body, by entering once again into union and communion with Him — and at the same time with each other. And the essence of this union is prayer. When we pray together, our prayers are stronger, supported by our mutual effort and by God's grace. And so it is possible for all to pray when we gather together in Church, for our union with one another in the labor of prayer facilitates our union with God. So let us gather in Church and pray, as often as we are able! In addition to this, it is suitable to pray with our loved ones — our spouse, our children — at home. It has been truly said that "the family that prays together stays together." Prayer is the tie that binds us to each other and to God. And this prayer is also easier than that solitary prayer. So while continuing to labor in our personal prayers, let us not neglect to come together in prayer as often as possible both in church and with our families at home. As St. John assures us, this time spent in prayer together will be more fruitful (for all but the very few) than the time spent laboring in prayer alone. Triumph Of Orthodoxy. Pleasures Of Sin For A Season. Audio homily 2010. What is the triumph of Orthodoxy? A short synopsis of the historical background, then discussion of what this triumph is for the individual. It involves "faith", understanding that the pleasures of sin are for a season, and believing that a good thing CAN come out of Nazareth. Hebrews 11:24-26, 32-12:224 By faith Moses, when he was come to years, refused to be called the son of Pharaoh's daughter; 25 Choosing rather to suffer affliction with the people of God, than to enjoy the pleasures of sin for a season; 26 Esteeming the reproach of Christ greater riches than the treasures in Egypt: for he had respect unto the recompence of the reward. 32 And what shall I more say? for the time would fail me to tell of Gedeon, and of Barak, and of Samson, and of Jephthae; of David also, and Samuel, and of the prophets: 33 Who through faith subdued kingdoms, wrought righteousness, obtained promises, stopped the mouths of lions. 34 Quenched the violence of fire, escaped the edge of the sword, out of weakness were made strong, waxed valiant in fight, turned to flight the armies of the aliens. 35 Women received their dead raised to life again: and others were tortured, not accepting deliverance; that they might obtain a better resurrection: 36 And others had trial of cruel mockings and scourgings, yea, moreover of bonds and imprisonment: 37 They were stoned, they were sawn asunder, were tempted, were slain with the sword: they wandered about in sheepskins and goatskins; being destitute, afflicted, tormented; 38 (Of whom the world was not worthy:) they wandered in deserts, and in mountains, and in dens and caves of the earth. 39 And these all, having obtained a good report through faith, received not the promise: 40 God having provided some better thing for us, that they without us should not be made perfect. 1 Wherefore seeing we also are compassed about with so great a cloud of witnesses, let us lay aside every weight, and the sin which doth so easily beset us, and let us run with patience the race that is set before us, 2 Looking unto Jesus the author and finisher of our faith; who for the joy that was set before him endured the cross, despising the shame, and is set down at the right hand of the throne of God. The First and most deadly sin of Cain. 2nd Monday of Great Lent. “ 1. And Adam knew Eve his wife, and she conceived and brought forth Cain and said I have gained a man through God. 2. And she again bore his brother Abel. And Abel was a keeper of sheep, but Cain was a tiller of the ground. 3. And it was so after some time that Cain brought of the fruits of the earth a sacrifice to the Lord. 4. And Abel also brought of the firstborn of his sheep and of his fatlings and God looked upon Abel and his gifts, 5. But Cain and his sacrifices he regarded not, and Cain was exceedingly sorrowful and his countenance fell. 6. And the Lord God said to Cain, Why art thou become very sorrowful and why is thy countenance fallen? 7. Hast thou not sinned if thou hast brought it rightly, but not rightly divided it? Be still, to thee shall be his submission, and thou shalt rule over him.”(From Gen 3:21 – 4:7, read in the Sixth Hour, the 2nd Monday of Great Lent). What was the worst sin of Cain? Do not say “murder”! Cain became a murderer because of his previous sins, and the single greatest sin a man can commit, which eventually led him to murder his brother Abel. Cain’s terrible fall should make us tremble with fear, as he trembled till the end of his days, because the beginning of it was so ordinary, and such a common sin. Cain and his brother Abel both offered sacrifices to God. This was before the institution of sacrifice as the Jews would later know it; the brothers made their sacrifices purely because, as St John Chrysostom tells us, their consciences told them to do so. Inherent in man is a longing to be with God, to communicate, to beseech. Without any formal laws the conscience of the brothers led them to offer something of their labors to God. “But Cain and his sacrifices he regarded not”. This is not because, as some wrongly believe, that Cain offered produce, and Abel a more “perfect” sacrifice of animal flesh. St John strongly disabuses us of this notion. There was nothing wrong with the type of sacrifice either brother offered. Cain offered a good thing to God, but he did not choose it carefully, as Abel did. Abel picked the best of his flock (the ”firstborn”) to offer to God, while Cain only haphazardly chose some produce to bring. In anything we do, we have two choices that must be made. Everything we do must be evaluated using these two criteria: It must be the right thing to do, and we must do it in the right way. Cain’s first sin is all too common in our life. We may indeed sin in this way more than in anything else. We sin this sin of Cain when we add to our good works, thoughts and sayings a mix of pride, self-interest and self-absorption. It is good to offer our prayers, but do we pray with attention and care? Are our prayers the “first fruits” of our day, of do they happen according to our convenience? It is good to come to the church to worship, but do we come late, or rarely, or stand inattentively, finding pretexts to leave the service frequently? It is good to make our confession during Lent, but if we do not confess other times because of laziness, then we sin this sin of Cain. So many times, daily, hourly, we do things without care, without attention, with false or ambiguous motives. Perhaps one would protest that these things are “small” sins. Small sins are like small lion cubs. They inevitable get larger and uncontrollable unless great effort is taken to control them when they are small. Clearly, Cain was jealous. The Lord assured him that his place in the family was not being changed. His way of living, his attitude was being questioned. Cain had an opportunity to repent, and change, but, he soon thereafter took his brother out into a field on some pretext and murdered him. Murder was the child of inattention, followed by stubborn unrepentance. Perhaps another would protest that “mere” inattention in spiritual things can not lead to murder. This is a perilous position to take, because the Holy Scripture here and in many places clearly contradicts such a view. The inattentive man is capable of ANY fall. The attentive man will repent when his sin is found out, and his repentance will save him from more and worse sins. All scripture is from the Septuagint (the “Brenton” translation). This is the authoritative text for Orthodox Christians. In some cases, it differs markedly from the Hebrew Masoretic text. Most English bibles are based on this text, such as the King James, Revised Standard, etc. The KJV version contains: “And the LO.RD said unto Cain, Why art thou wroth? And why is thy countenance fallen? (7) If thou doest well, shalt thou not be accepted? And if thou doest not well, sin lieth at the door. And unto thee shall be his desire, and thou shalt rule over him” Gen 4:6-7 KJV. You are currently browsing the Saint Nicholas Orthodox Church blog archives for February, 2010.